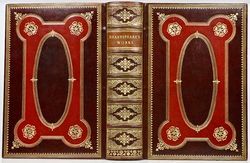 Reagan's Rare Books specializes in fine bindings and leather bound books dating primarily from the 18th century to early 20th century in a wide range of subject matter such as History, Americana, and Literature. Terms of sale for Reagan's Rare Books RARE ANTIQUARIAN BOOKS ARE FRAGILE AND NEED TO BE HANDLED WITH CARE. All books are carefully bubble wrapped and packed in a box with adequate packing peanuts to prevent any damage in shipment. All books are shipped with delivery confirmation and tracking. Books are automatically insured. 100% satisfaction guaranteed. Returns accepted for any reason within 30 days of receipt.